Fall is the perfect time for sports, hands down. With baseball playoffs, Monday Night Football, and hockey in full swing, it is a veritable feast of athletic endeavors. Going for a jog in the changing leaves and cheering from the soccer sidelines might fill your weekends, but these series with sports superstars will occupy your young readers’ evenings. 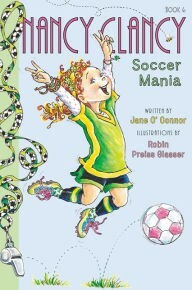 Nancy Clancy, Soccer Mania (Fancy Nancy Series: Nancy Clancy #6), by Jane O’Connor and Robin Preiss Glasser In the popular Fancy Nancy Series, Nancy typically doesn’t like to follow the crowd, but a team effort can turn anyone into fan of groups. Nancy is a pro at painting her nails, cheering, and wanting to be good at soccer, but she is not quite there yet. This book is really great for that young soccer player who loves the sport but just isn’t ready for the all-star team. Kickoff!, by Tiki Barber and Ronde Barber Ok, this is super cool — a football chapter book series, written by football superstars. 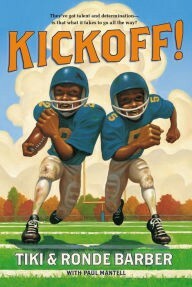 Based on the real life stories of its authors, the book features two boys, Tiki and Ronde, who are getting ready to start junior high with a new team, new rules, and new challenges. Hard work and perseverance will become their best friends as they navigate this unknown world on their paths to NFL glory. Your gridiron fanatic will want this book with them on the sidelines. 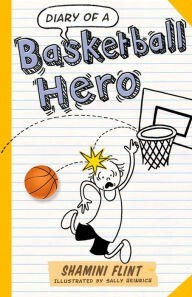 Diary of a Basketball Hero by Shamini Flint and Sally Heinrich Fans of basketball and the Wimpy Kid series will find their new hero in Marcus, a math whiz with zero sports prowess. At his dad’s encouragement, Marcus is thrust on the path of basketball superstardom, or at least on his way to dribbling without falling. Kids who are torn between the court and the bookshelf might be swayed to sit down for just a bit longer with this witty story, which is filled with engaging art. 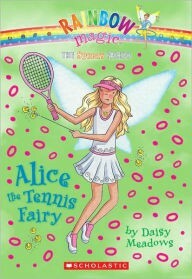 Alice the Tennis Fairy (Rainbow Magic: Sports Fairies Series #6) by Daisy Meadows Even Fairies can get downright competitive, especially when it comes to the Fairy Olympics. In a series of seven books, fairies Rachel and Kirsty have to help each athlete get their equipment back from the evil Jack Frost and his horde of goblins. This time around the girls have to help Alice reclaim her tennis gear before she is due on the court. Part sports chapter book, part mystery, all adventure, parents of fairy loving readers and athletes will really hit a magical home run with this series. 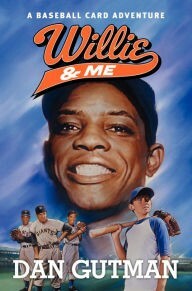 Willie & Me by Dan Gutman One of many in the Baseball Card Adventure Series, main character Joe Stoshack travels back in time to investigate the “Shot Heard Around the World.” Will he accidentally mess up the career of Willie Mays in the process? Can the other players he has met in his travels help him avoid disaster? Time traveling with baseball cards and famous players has never been so much fun. Superfans will especially love the black and white photos and the player stats that are included in each book. 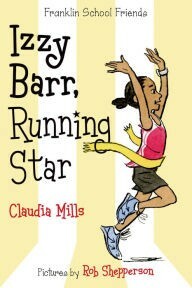 Izzy Barr, Running Star by Claudia Mills and Rob Shepperson Each student of the Franklin School Friends series is a stand out at something, and Izzy Barr is the best runner around. Unfortunately for her, her brother is also a great athlete and possibly the apple of their father’s eye. Will things turn around for Izzy when the big 10k comes to town? For the budding track athlete or distance runner in the family — or for the kid who wants a fun way to pass the time while mom and dad run, pick up Izzy Barr! 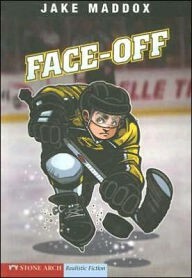 Face-Off by Jake Maddox and Sean Tiffany With jealous teammates, including his own brother, Kyle Parker has to balance becoming a hockeypowerhouse while keeping his family — and teammates — on his side. This book is a great choice for anyone who is hesitant to read, loves hockey, or needs a slim fun book to pop into their stick bag. If you are new to hockey there is also a glossary of terms in the back to get the whole family up to speed. What do your young athletes like to read when they aren’t at practice? Originally published at www.barnesandnoble.com on November 30, 2015.